The information presented on this page was originally released on October 29, 2014. It may not be outdated, but please search our site for more current information. If you plan to quote or reference this information in a publication, please check with the Extension specialist or author before proceeding. The American College of Veterinary Internal Medicine recently honored Dr. Maria Perez-Hernandez with the ACVIM Knecht Resident Award. The Knecht award, named in memory of veterinary neurologist Dr. Charles Knecht, is given in recognition of outstanding research that advances veterinary neurology. Perez-Hernandez was awarded for the design, development and testing of an intracranial pressure bolt for use in veterinary patients. 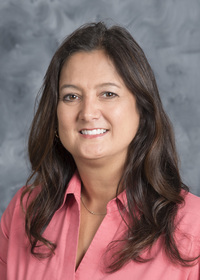 Perez-Hernandez and her colleagues, including Dr. Andy Shores, clinical professor and chief of neurology/neurosurgery at the MSU College of Veterinary Medicine, developed a bolt to be used in the monitoring of intracranial pressure after an animal suffers a traumatic brain injury. Traditionally, human intracranial bolts are used when treating canine and feline patients, but they often become dislodged. The MSU team has proposed a novel prototype design for an intracranial bolt that might be adequate for a variety of skull sizes. Perez-Hernandez presented her findings at the ACVIM annual conference.